The snow piled so high you could touch telephone wires. On winter days like this one, when arctic wind chills are freezing off eyelids in much of the country, the best way of feeling warm might not be coffee or scotch but a healthy sense of historical perspective. With luck, this one photo recently featured by NASA can help with that. It shows the aftermath of a particularly nasty blizzard that hit Upper Michigan in 1938 – the region's so-called "Storm of the Century" – when snow drifts piled up so mightily that they almost covered utility poles. The snow began falling early on tomorrow's date and didn't stop for at least 30 hours. Moisture-laden air pouring up from Texas gave the precipitation the consistency of wet sand; when it hardened, it created an armored shell over all it touched. Vegetation near the waterfront started looking like it was covered with icy, dripping candle wax. "Nothing moved except by foot for three days." Although a total of 30-plus inches is reported to have descended, ferocious winds shaped the snow into massive dunes that quickly eliminated the possibility of travel. Bus service ground to a halt. One Chicago-bound train stalled in drift that's said to have measured 30 feet high. 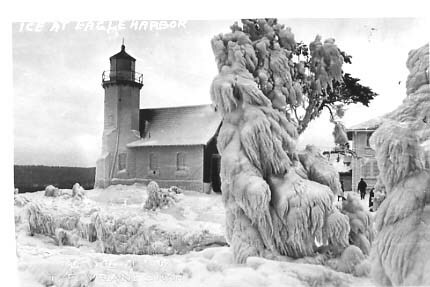 "Nothing moved except by foot for three days," recalls one Marquette County resident in meteorologist Karl Bohnak's engaging book, So Cold a Sky: Upper Michigan Weather Stories. "The people that came walking could reach the telephone wires with their hands." As contemporary plow technology was not equipped to deal with this magnitude of powder-dump, crews working in six-hour shifts used shovels to pass load upon load of snow back to trucks. In this laborious fashion, it took six days for them to clear an emergency path stretching for 10 miles. That kind of progress left many people up cow-flop creek without a paddle. Some had to crawl out of second-story windows to access the outside world. In Ironwood, children trapped inside a school were forced to sleep four nights on exercise mats in the gym. There were casualties: A plow driver who asphyxiated on carbon monoxide and a lumberjack who froze inside his truck. An opera house in Marquette was also severely damaged by a conflagration, as firefighters had to contend with poor water pressure and white-out snow conditions. In the end, the water from their hoses gave the building's facade the appearance of Jack Nicholson's icicle-bearded face at the end of The Shining. So yes, while it's cold today, at least we don't have to contend with what will become in some local legend the "storm against which all others are measured."